All age groups below the age of 55 experienced significant reductions in average hourly pay between 2008 and 2013, particularly those aged 16 to 34. This was in spite of the younger people being better qualified (Hills, 2015.) Only among pensioners aged over 65 has there been a reduction in those in poverty according to Joseph Rowntree. Citizen’s Advice Bureau published research in 2015 which found an important jump in borrowing among young adults, not simply explained by student loans. The data showed 15-24 year olds have more than double the debt of any other group of people. That is, average debts of £12,215, up from £5,785 in 2008-10 and £3,988 in 2006-08. Analysis suggested this is not just because of rising student loans although they are a significant factor in the financial profile of young people. Among 15-24 year olds, personal loans were nearly five times higher in the latest data than in 2006-08, while loans from friends and family rose from an average of just over £30 to more than £1,000. By the time people reach 30, “other debt” including payday loans has replaced the student debt of the youngest Gen Z cohort. Meanwhile, with home-ownership rates in sharp decline, young people aged 25 to 35, known as “Gen X and Gen Y” had unusually low wealth, putting them more at risk. To compound the problem, the research found that people with no property are nearly three times as likely to be in arrears as those with a small amount of property. In 2012 rightmove.co.uk, one of the UK’s largest property websites, claimed that 69% of prospective first- time buyers were university educated, with an average age of 30 compared to 32 for non-graduates. As less than 30% of them had not been to university, this indicates that single people and particularly lone parents are most at risk. However, the picture has improved a little. Recent figures from the Office for National Statistics show that fewer young people say they are under financial pressure than in 2012. 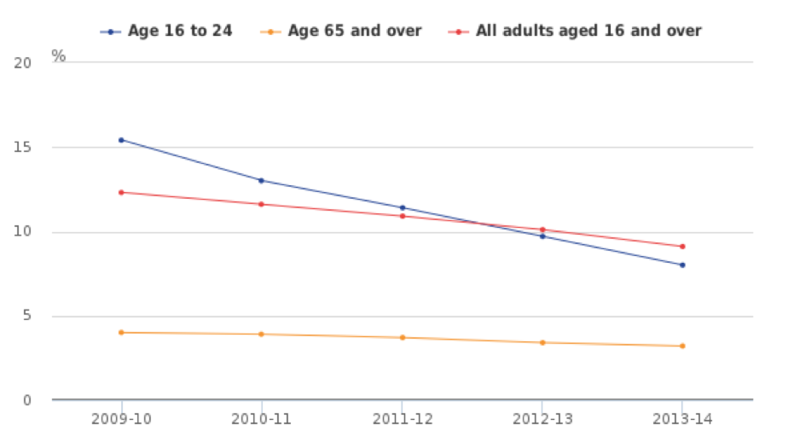 The proportion of 16 to 24 year olds who were finding it difficult or very difficult to get by financially decreased by seven percent from 15% in 2009 to 2010 to eight percent in 2013 to 2014. Satisfaction with household income among 16 to 24 year olds has increased slightly, from 51% in 2009 to 2010 to 56% in 2013 to 2014. This data is backed up by EU data about the UK indicating that between 2009 and 2015 average income for young people has increased, while the average debt has decreased. Average net incomes for people aged 16-24 rose by £2000 from about £13,500 in 2009 to £15,500 in 2015. Average debts fell by £400 to £2,600 in 2012-14, from £3,000 in 2010-12.